We take an in-depth look at hybrid golf clubs as we discuss what they are and what advantages they have to offer. While golf is an old game, it is also one that has remained mostly the same throughout the course of its long life. It is a sport dependent on tradition after all, which is why it is not surprising that equipment options have remained mostly the same even, while the technology has improved in leaps and bounds. New clubs aren’t introduced very often in the game of golf, and when they are, they usually are met with scrutiny. Understandably so. Golf clubs are not cheap, and no one wants to waste money on gear that will either perform poorly or get banned by the end of the year. That said occasionally a new piece of equipment will come around that forever changes the way people play the game. In recent history, no club has achieved that distinction more so than the hybrid. Today we will be taking an extensive look at what is truly one of the most versatile clubs on the market. Read on for an introduction to hybrid golf clubs! For lack of a better way to describe it, the hybrid is a combination of an iron and a wood, though as far as design is concerned it usually more closely resembles the appearance and features of a fairway wood. Hybrids are designed to replace the difficult to hit long irons that only collect dust in most people’s bags. Unless you are well practiced it can be difficult to make consistently pure contact with a three iron. Because of that, many players will hesitate to reach for their longer irons, and when situations arise in which they must their chances for success are regrettably minimal. It’s much easier to get good results with the hybrid. Though hybrids have the loft and distance of an iron, they have the forgiving face of a wood, and their center of gravity makes it easy to hit shots nice and high from the fairway, rough, or even fairway bunker. I think what I like most about mine though is how well it works from the tee. I play a nineteen-degree hybrid and while from the fairway I typically get the same distance I used to get from my 3-iron, from the tee I’m able to squeeze a little bit more out of it without increasing my efforts. I call it the most versatile club in the bag because it’s great for the tee ball, excellent from the rough, the short grass, and the fairway bunker, and it can even be used quite effectively (with a little bit of practice) to hit chip shots on the fringe of the green. What is a rescue club then? “Hybrid” and “rescue club” are terms that are used interchangeably. Some manufacturers will refer to their hybrids as rescue clubs due to how versatile they are, but you’re getting the same function either way. If you make the decision to add a hybrid to the bag you will want to be sure that you are choosing lofts that will appropriately substitute the clubs you are replacing. Below you will find a chart detailing which lofts equate to which irons. Literally no one plays a 1 iron anymore but of course, most players still incorporate 3 woods into the bag. Hybrids and woods are designed so similarly that replacing one for the other is not strictly necessary but there are still reasons to do so depending on your preferences. Hybrids are designed to be swung like an iron, meaning they require a steeper angle of attack. Fairway woods, on the other hand, are swung similar to drivers and come through the ball with more of a sweeping motion. Some players, particularly, struggling amateurs, have trouble replicating that move without the help of a tee, and may, therefore, benefit from switching to a hybrid. If no one plays the one iron, next to no one plays the 2 iron. Still, the 5 wood is a useful club that still enjoys a little bit of popularity with amateurs and pros alike. The benefits to switching your 5 wood out for a hybrid are the same as they were for the 3 wood. This is probably one of the more popular substitutions when it comes to adding a hybrid to the bag. If you struggle with the long irons at all, this is something to consider. Slightly less common than switching for a 3 or 4 iron, but gaining in popularity. Full hybrid sets are also growing in popularity. The hybrid set is exactly what it sounds like – an entire bag of clubs filled with hybrids from the three iron all the way up to the pitching wedge. In these sets the higher lofted clubs generally resemble an iron more than they do a fairway wood, but they still benefit from the added forgiveness. Whether you are a traditionalist who is unsure if they are ready to make the leap to hybrids, or you are just somebody who is very cautious about dropping a couple hundred dollars at a sporting goods store, it can be a challenge deciding if the hybrid is really for you. Professional opinion as of late seems to widely favor incorporating a hybrid or two in the bag. Most professionals that work with struggling amateurs on a daily basis see better results from players with hybrids in their bags than they do from those still trying to force the long irons to work for them. Unless you hit the ball like Jordan Spieth (and even he carries a utility club from time to time) you are going to want to strongly consider carrying a hybrid. In fact, the question you really should be asking yourself is, how many hybrids should I carry? Naturally, that is a question you will have to answer for yourself. Personally, I think there is a fine line between practical and excessive hybrid use. While it can make sense to substitute for a three, four, or even five iron, once you get into the six, seven, eight iron territory, you may be shooting yourself in the foot a little bit. Hybrids are designed to hit long straight shots that get in the air quickly. That’s great for the long irons in which those results might be otherwise hard to come by, but when you get into the mid and short iron territory you may want to consider taking a more conventional approach. Keep in mind that while long straight and high are great qualities for most shots, they aren’t what you want every time you step up to the ball. Most players will find it easier to control shot shape and trajectory with an iron than they will with a hybrid, even if controlling trajectory for you simply means punching one out of the trees. Irons are also going to garner a little bit more backspin than hybrids. When it comes to long irons, that won’t really make much of a difference, but if you are looking for nice, soft landings from approach shots hit with your mid or short irons, a more conventional bag configuration will probably serve you best. It seems nowadays that every club on the market features an adjustable component to it. Hybrids are no exception. Depending on the manufacturer, adjustable hybrids can offer a variety of different things. Sometimes the adjustability of a club means it features several different weight options, while other times it may mean you can control how open or closed the face is at address. Regardless of how the adjustability is offered the intention is always the same: to give you the opportunity to hit straighter shots by optimizing the design of the club to suit your swing. In theory it sounds great, but you also need to be careful. 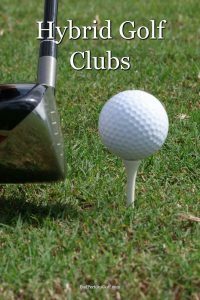 Generally, you are responsible for adjusting your own club and unfortunately most amateurs are not usually knowledgeable enough to know what settings are best for them. If you do decide that you would like to play around with the settings on your hybrid, it may be best to do so in the presence of a professional. Hybrid golf clubs aren’t for everyone. At the end of the day how you configure your golf bag is entirely up to you, which is one of the beautiful things about the sport. That being said, I do hope that you will consider at least hitting a few shots with a hybrid the next time you make a visit to your local golf shop. The way I see it, golf is hard enough as it is, and very few advantages are extended to the struggling amateur. When a club has been proven over and over again to make carding a decent score a little bit easier, the decision whether or not to play it seems pretty simple to me.